Start your day with a bowl of nutritious and healthy granola. 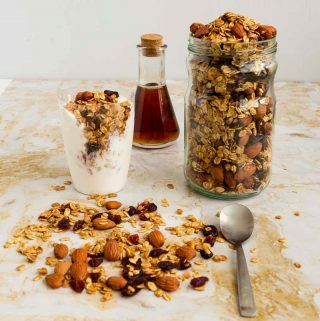 This simple, easy and effortless recipe for homemade cranberry almond granola takes five minutes to prepare and less than thirty minutes to bake. With the natural sweetness of cranberry and honey accompanied by toasted almonds make this an absolute treat any time of the day when you need a quick snack or breakfast at dinner. Morning breakfast has to be something more substantial, yet nutritious and healthy. Right? What do you have for morning breakfast? For me and my Rhea, it is good old oats porridge. Yes, every morning I have to have a bowl of porridge. I know! Sounds boring but it’s my ritual. For the rest of the family, it’s granola. 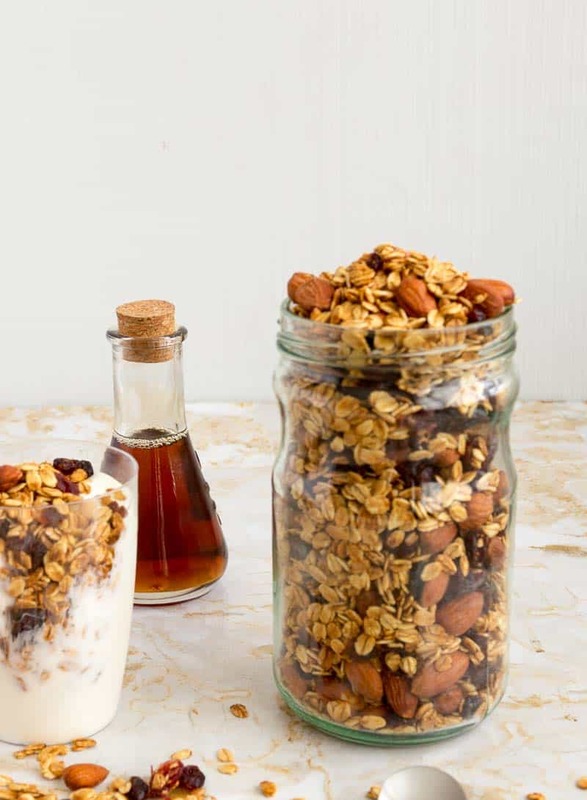 Granola is by far the most favorite snack or anytime breakfast in our home. It’s one that we pick to snack at odd times when we are hungry. So often at my 4 pm sweet craving I will grab the jar of granola for a quick snack. Having granola for dinner or having breakfast for dinner is another common thing in our home. Often when we have an indulgent or as we like to call it ‘ a big lunch’, dinner has to be light. And often light would mean a bowl of cereal aka homemade granola. Unfortunately, commercial granola is loaded with sugar. So for me if you put granola and healthy in the same sentence you had better say homemade. Know what I mean? There is no way I would be able to snack on a commercial brand of granola. Which is why, in our home, granola is usually homemade. 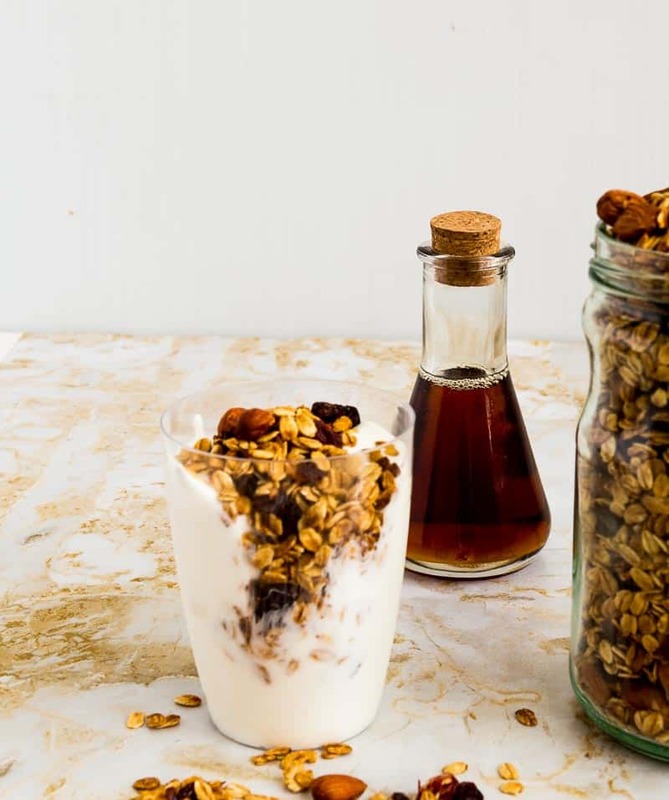 You can find all my breakfast granola and granola bite recipes here, or all breakfast options here. The best part of granola is that it is so easy and so quick to make. Often people don’t know how easy it is to make so they go picking the store bought granola. I think everybody must try making granola at least once. Sounds weird but there is something about fresh granola. The nuts are crisp and bursting with that nutty flavors. The oats are toasted and just crumble in the mouth. The sweetness of the liquid used like honey, maples etc soak in and the get toasted… Which is usually why I never make big batches of granola. I love making small batches so we have it fresh. For us, one batch of granola works for a week. Now you can’t say that with those boxes you buy at the supermarket can you? 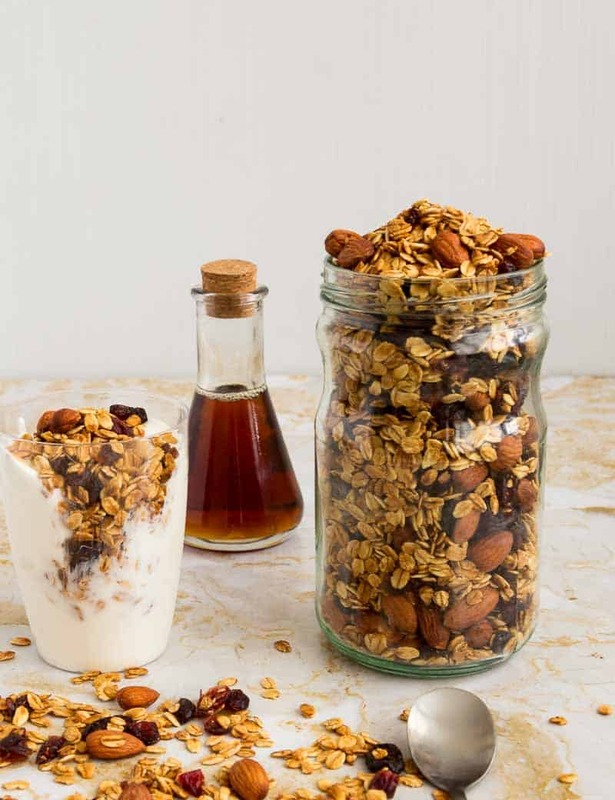 Rolled oats – good old fashion oats is the way to go when making granola. Brings the best flavors. The liquid ingredients soak into each individual grain which then gets toasted beautifully on its own. If you use quick cooking or other you may end up with a soggy mess. Honey – I prefer natural sweetness when it comes to my granola, that way I can snack on it guiltfree. If you don’t want honey you can use maple syrup or agave syrup. Often I even like to use Silan which is a natural date, honey. Very delicious but has a darker color so the final granola is a bit darker. Cranberry – This amazing fruit is packed with lots of nutrition and good health benefits. One I think you must always have in your diet. It is also a great way to add natural sweetness. What I like best about it, is that it has this tart flavor when you bite into it. Love it. Almond – this is another powerhouse of good nutrition and health benefits which is why you get them in all healthy snacks from almond butter to snacks. I usually always have them toasted and in a jar for a quick snack. Coconut oil – you can use canola oil in this as well. Coconut oil is considered to be more easily absorbed by the body. The added benefit is that it does give a nice color to the granola. Yes, it helps toast those individual grains of oats beautifully. Pour the liquid mixture over the dry mixture. This batch will last for up to 2 weeks at room temperature. They make the perfect base for granola bars as well. Homemade granola is the best, I can’t wait to try this at home. Look so yummy and tempting. Absolutely, Calleigh. Homemade is always the best especially granola. Homemade granola is the BEST. One you make your own…you will NEVER want store bought again. Love this with yogurt…or by the handful. Exactly Gloria. Once you eat homemade you will never go store-bought again. Homemade granola is the BEST!! I can eat this all on it’s own….but love it with yogurt. People who have never made it before….will never buy granola again once they try homemade. Absolutely Gloria, me too. I can eat granola on it’s own as a snack or with yogurt. I love granola not only for breakfast but sometimes as a snack during the day. Never tried to make homemade granola, thought it’s going to be a bit difficult. Silly me, Cannot wait to give it a try! Me too. I often snack on granola but usually only when it’s homemade. I LOVE granola and eat it for breakfast, lunch and dinner. 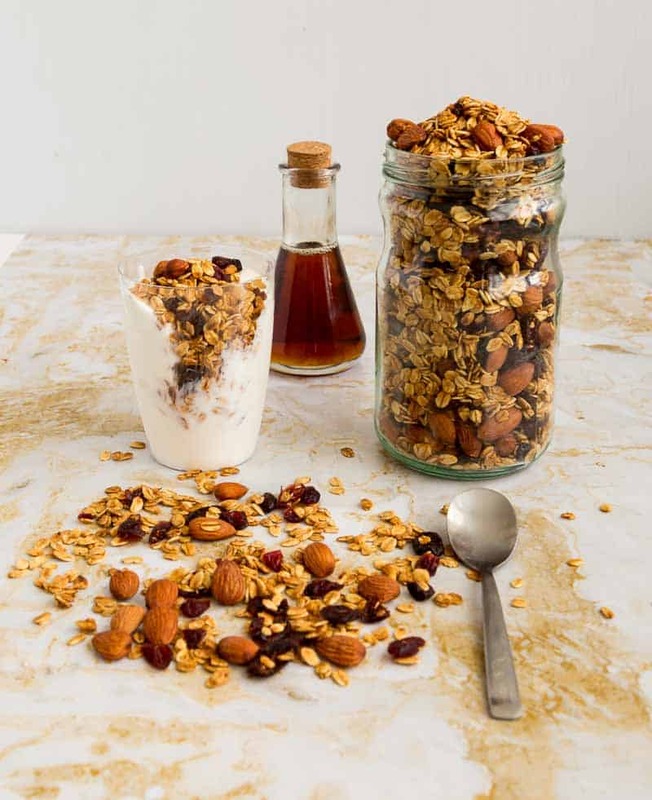 Homemade granola is always the best – we can control the sugar and add all healthy ingredients. Your recipe sounds absolutely delicious and so easy to make. Thanks, Pavani. Yes, it is very easy to make. 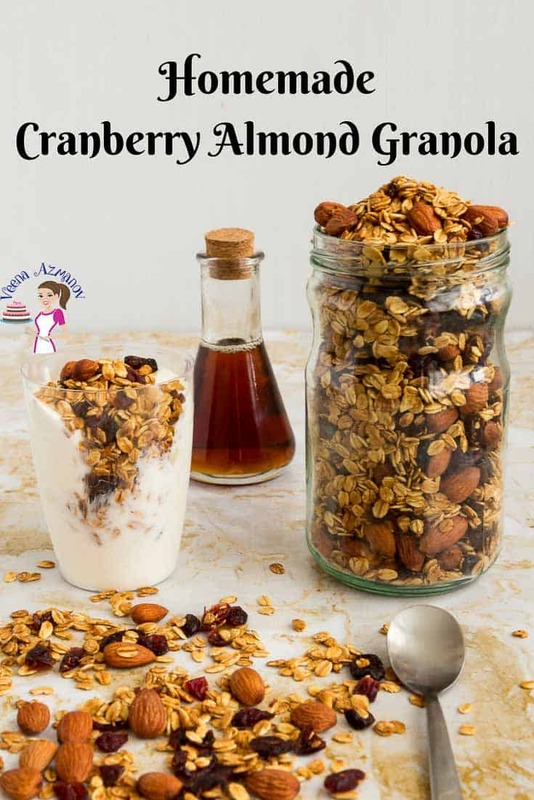 I adore homemade granola, and this is a great combo of flavors and crunch. Great way to start the day! Homemade granola is so easy to make and so delicious. I honestly don’t know why people even buy granola in stores. 😉 I love this crunchy almonds + sweet cranberries combo. My family would love this! I know what you mean. It’s so easy to make at home I never buy store bought. Homemade stuff is always amazing, especially things like this. Feeling good about what I serve my family is awesome. Exactly, knowing what you give your family is so important these days. I was just thinking of how I need to have healthy snacks on hand for my son this summer. Can’t wait to give this a try especially to make them into bars. I’ve not tried that before. Thanks, Denise. I love to snack on granola. I’m always at the other extreme though. I over snack granola. Lucky, this is homemade so I know it’s not as loaded with sugar as the store brought. Here is one kind of food I have never really tried other than on top of yogurt and never made granola. It sure looks tasty! one day I will make your recipe it sounds really great! Thanks, Claudia. You must try making homemade granola. It’s really delicious and healhty. I absolutely love making homemade granola partially because there are so many flavor combinations and ways to do it. I can’t wait to try yours! Absolutely, Carlee. So much you can do with it.